Background: Chin implants in the history of plastic surgery was the first and still most common form of jaw augmentation. Many surgeons today still see the patient’s desire for lower aesthetic facial enhancement as a chin augmentation procedure. 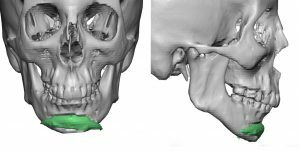 But today’s patients are more informed about the possibilities of jaw augmentation and are often desirous of a more complete jawline effect. This is relevant for both men and women as a well defined jawline has become a non-gender specific aesthetic desire. To achieve a total jawline augmentation a variety of standard chin and jaw angle implants exist to accomplish that effect. However, for those patients that seek a connected linear look around the jawline, a custom jawline implant is the better way to go. Being able to control the various implant dimensions and shapes of the chin and jaw angles has obvious advantages both in the result and in aiding symmetric placement. Many patients that present for a custom jawline implant, approximately half, already have existing implants in place. Most commonly this is a chin implant or sliding genioplasty from a prior ‘jaw augmentation’ procedure. Having such implants in placed is actually a design advantage. 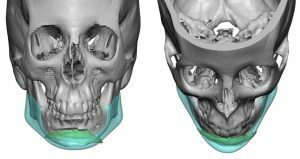 Once you have an augmentation change done and you can see both the external facial change and its position and shape on the bone, that provides valuable information as to how to design a new implant for an improved and more complete effect. Case Study: This petite middle-aged female had a small lower jaw with a Class II malocclusion with a history of having a chin implant placed 45 years ago as a teen. She did not know what type of chin implant it was and was never really happy with it. The chin implant was obviously asymmetric as seen externally and both wings of the chin implant could be felt beneath the bone. 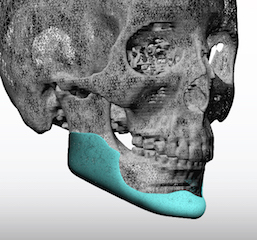 A 3D CT scan showed the asymmetric position of the implant on the chin bone. She desired chin implant removal and replacement with a total jawline implant. 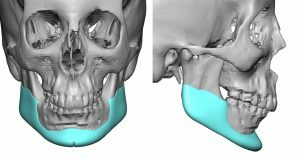 Using the 3D CT scan a custom jawline implant was designed for a modest or petite jawline implant that would be appropriate for a small female. She needed more horizontal chin augmentation with a more narrow and rounded chin shape. A chin implant that was not quite satisfactory decades ago motivates a patient years later to still seek a better solution. Recognizing that the real problem was that the entire jawline was short, the use of a custom jawline implant offers a more contemporary solution to an improved lower third of the face enhancement. 1) Old chin implants are often associated with significant bone overgrowth, particularly when they are positioned high up on the chin bone. 2) Removal of a pre-existing chin implant presents the opportunity to consider a more complete jawline augmentation. 3) The custom implant designing process allows one to see the existing chin implant which then allows one to design a more effective implant.